I met Sandra Schäfer in Kabul and made interview via email whilst she was in Kabul for a short period. Sandra Schäfer studied Art, Political Sciences and Sociology in Kassel, London and Karlsruhe. She is filmmaker and curator. She lives and works in Berlin. Since 2002 she has been several times in Kabul and Tehran for doing research for her film project Passing the Rainbow and the film festival Kabul/ Teheran 1979ff. She curated film programmes about Afghanistan and Tehran in Belfast, Lüneburg, Karlsruhe and Berlin. Currently she works together with Elfe Brandenburger on the documentary film Passing the Rainbow. She is coeditor of the book Kabul/ Teheran 1979ff: film landscapes, strained cities and migration. The book got published 2006 in the publishing house b_books in Berlin. Films/ videos/ video installations: »Traversée de la Mangroves« (2006), »The Making of a Demonstration« short film (2004), »A country’s new dawn« (2001), »The invisible services« (2000), »The joy of communication, open with an elgant manner« (1999), »England Germany « (1997), »Shift« (1996). How you start “Kabul-Tehran” book, what you wanted to tell to your readers? 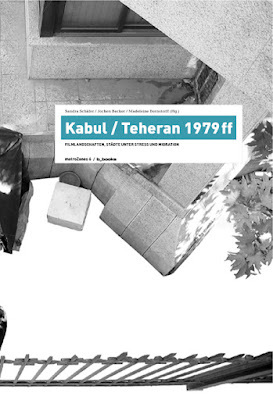 The book Kabul/ Tehran 1979ff: film landscapes, cities under stress and migration is the continuation of a film festival that I organized together with my two colllegues Madeleine Bernstorff and Jochen Becker 2003 in Berlin. It was part of metroZones in ErsatzStadt (substitute city)– a project that focussed on the social and political practices in the cities of the South. We showed 60 films from Afghanistan, Iran and Europe focusing on the changes in the two cities Kabul and Tehran after 1979, the topic of migration and the situation of film making. We invited filmmakers, actresses, sociologists, philosophers and urban planners to discuss these issues. Old films from the archives which had never been shown in Germany before as well as contemporary films of different genres were been screened. Our attempt was to show Afghanistan not only as backdrop of action movies like Rambo 3 but to introduce its own cultural production and the social and political changes through different perspectives. The book follows up this idea. A long interview with the filmmakers Sidiq Barmak and Ingenieur Latif Ahmadi gives an introduction in the history of Afghani cinema. It is supplemented by a filmography of all Afghani feature films composed by Wahid Nazari and short film descriptions of all movies that were shown during the Kabul/ Teheran-festival. A text by Bettina Schiel and Stefanie Görtz gives an insight into the current film and media production in Kabul. The architect Zahra Breshna writes about the history of Kabul, the old town and its traditional customs. Ajmal Maiwandi who is responsible for the restauration of Babur Garden at present introduces together with his collegue Anthony Fontenot the different protagonists of the city of Kabul like the refugees, rich returnees, warlords and internationals with their different interests and how they shape the city. The migration researcher Helmut Dietrich analyses how international organisations and governments try to control and manage the moving of the migrants and how the refugees circumvent these regulations. Jochen Becker follows the filmproduction of Afghani filmmakers in Tehran and the representation of Afghani refugees in Afghani as well as in Iranian movies. Excerpts from the book Women of the Afghan war by the Canadian writer Deborah Ellis present the activities of Afghani women inside and outside the country after the Sovetian occupation. A variety of perceptions analyse from different perspectives the changes in Kabul and Tehran after 1979 including Afghani and Irani people living in exile as well as contributions by the second generation or by authors who have grown up in Europe. What was the opinion support your motivation on two specific region Afghanistan and Iran? After September 11th I started together with a group of filmstudents to watch Iranian films. We were looking for a different approach to the political discussions at that time and wanted to get to know the situation through the representation in the local film production. Watching the different films, discussing with Iranian people living in Germany and studying the history of Iran with its deep political changes after 1979 and its consequences gave a very contradicrory insight into the present political situation. I started to develop a screenplay for Tehran. The research for this screenplay directed me from Tehran to Kabul where I had the luck to join the making of the film Osama by Sidiq Barmak. That is how I got to know the film making scene in Kabul and how I found out more about the short history of cinema in the country without images. During the last years I could follow the building up of the filmmaking production in Kabul. The book focusses on the two cities Kabul and Tehran because both of them were deeply changed through the date 1979 – with the revolution and the foundation of the Islamic republique in Iran and the invasion of the Sowjetian army in Afghanistan. The invasion of the Soviets in Afghanistan was the beginnimg of the end of the cold war whereas with the foundation of the Islamic republique Iran the political Islam took shape. These events have influenced world politics until now. Besides this Afghanistan used to be for many years the country with the highest migration rate inside and outside the country. Most of the refugees went to Pakistan and many to Iran where the majority of the male refugees worked on the construction sides and built up the city of Tehran. How was the interest and reactions of filmmakers in Germany? Filmmakers in Germany were very interested to find out about Afghani cinema and filmproduction. Many of them did not know that there had existed a film production in Afghanistan since the 60s. And they did not know that there exists a film production now. The film Osama was one of the first Afghani feature films many filmmakers in Germany had ever seen. They are very keen to find out more about the situation in Afghanistan through local productions and to know under which conditions filmmakers work. Do you interest to print “Kabul-Tehran” to different version languages? Yes of course. It is a pitty that the book got published only on German as the readership is very limited. It should be translated into English and Dari. But we would need a publisher who would coordinate and support the translation. You can find some texts translated into English on the webpage www.metroZones.info. What is your plan in cinema arenas in the future? At the moment I work together with my collegue Elfe Brandenburger on the post production of the film Passing the rainbow. It is a film about acting and women in Afghanistan. We will finish it during the next months. In September 2007 we will organise in collaboration with Afghan film and the Goethe Institute a women film festival in Kabul. In November the festival will take place in Germany. In November 2006 I set up together with Jochen Becker and Elfe Brandenburger at Liquidacion total in Madrid the exhibition Kabulistan. We showed photographs of the daily life in the city of Kabul from 2002 to 2006 and films by Afghani filmmakers like Roya Sadat, Malek Shafi'i or Saba Sahar as well as films by Iranian filmmakers like Azita Damandan or Ali Mohammad Ghasemi about the situation of Afghani refugees on the border to Iran and in Tehran. The film programme got accompanied by the documentary film >Afghanistan 1362 – a cinematic diary made in 1984 by the East German filmmaker Volker Koepp as well as >Dream of Kabul by Wilma Kiener and Dieter Matzka about the Hippies in Kabul and the civil war in the 90s (www.liquidaciontotal.org). You had visited Afghanistan and its people, how you see them? I can recommend any contribution in the book and look forward to hear the readers comments.